NEW EB HEAD HAS LONG CAREER IN AVIATION, 1962 Waldo D. Waterman was born in San Diego in 1894. In 1909, during his High School career, he became very much interested in the exploits of the Wrights and Glenn Curtiss, and thru that interest started to build a glider. On July first of that year, he made his first successful air-borne flight down the slopes of a canyon near his home. He made several successful glider flights both gravitational and auto-towed during the next few weeks. He then took in a partner to build a full sized powered airplane, which he entered in the first Dominguez air meet, Jan. 1910. This plane was not completed in time for the meet, but later was set up at the Coronado Polo Field (where the main entrance to North Island now stands) during April, 1910. The engine did not have sufficient power to get the plane airborne, so auto-tow take-offs were used, with some success. The final flight however resulted in a bad crack-up and two broken ankles for Waldo. The following year, Curtiss moved his winter experimental station to North Island and Waldo immediately attached himself to the Curtiss camp. Aside from Curtiss, Waldo's immediate pal was Charlie Witmer. When the school closed for the summer, they left Waldo in charge, and they had not been long gone before the one remaining flyable airplane was seen to be flying at North Island, piloted by Waldo. At that time, he was also building his third aeroplane, a tractor type, powered with a four cylinder air- cooled Cameron engine. He had this plane on North Island late in 1911 and early 1912. When the Navy moved their three airplanes to the island in the Spring of 1912,, Waldo became very chummy with Lieut. Holden C. Richardson, and Ens. V. D. Herbster, and frequently accompanied Herbster on various flights to engage in experimental and practice work being undertaken. As a result of one of these flights, Herbster and Waterman enjoy the questionable distinction of having destroyed one third of the U. S. Naval Air Force, by dumping the Model B. Wright Hydroaeroplane into San Diego Bay. Influenced largely by his Navy flying friends and Glenn Curtiss, Waldo decided that an engineering education and background was what he should have to attain his aviation goals, and so he entered the University of California as a student in mechanical engineering, in the fall of 1912, where he earned extra money during vacations working for Early Birds Adolph Sutro, Chas. Patterson, T. C. McCauley and the Hall Scott Co. When World War One broke out, Waldo went immediately to San Diego to offer his services, but when the Medics took one look at his broken ankles and flattened feet, they said "no." He was offered the job back at the U. C. campus as Head of the Dept. of Theory of Flight, School of Military Aeronautics, which he accepted. While he was there, many of his students later attained great fame. Owing to the repetitious teaching, Waldo wanted to get into something else, so he went to work for the U. S. Aircraft Corp., who had a contract to build 100 Jennies. He ended up as Chief Engineer, and was retained to liquidate the Corporation at the end of the War. Always wanting to get back to So. Calif., Waldo bought up some of the parts, materials and equipment of U. S. Aircraft, and moved to the Santa Monica Area, where he set up the Waterman Aircraft Mfg. Co. Several custom-built planes were built here, but he was finally forced out of business when the Government started dumping planes on the market at ten percent of their cost of manufacture. He later bought one of the Jennies which he had built and started barnstorming around So. Calif., ending up as a fixed base operator at Ontario, Calif. After losing a bid on the L. A. - Salt Lake Air Mail contract to Western Air, local interest waned and Waldo moved his operations to Clover Field, Santa Monica. In 1927 he became Chief Experimental Engineer for the Bach Aircraft Co., builders of a light Tri-Motor Transport. With one of these planes, he won the Air Transport Race at the National Air Races in Cleveland in 1929, and later that year broke the 1000 Kilogram load carrying altitude record. 1928 saw Waldo procuring land for, and designing the Los Angeles Metropolitan Airport, now known as Valley Airport of the Los Angeles municipal system. He managed this airport unit mid 1930. Previously he had organized the Waterman Aircraft Syndicate to design and build an unusual four place low wing airplane with shock absorbing wings. He flew this plane to the 1930 National Air Races at Chicago with his wife, and later took it down the East Coast for tests at N. A. C. A. The 1929 Wall Street crash made financing impossible and amongst others, broke the Bach Co. Waldo was called in to liquidate this company and while doing this, he built the Waterman "Whatsit" which was the first tailess flying-wing monoplane in this country, and it was the first to use the modern version of the tri-cycle landing gear. This plane was the fore-runner of his "Arrowbile" later built in 1937. Late in 1932, Waldo reached the end of his financial rope, after three crackups of the Whatsit, and was fortunate in getting a job as a pilot on T. W. A. After a little over a year, his finances rejuvinated, he went back to work on the "Whatsit" as it seemed to fall into the Vidal concept of "every man's airplane." Thru his demonstration of the potentials with the "Whatsit," Waldo received a contract from the Government to build a prototype for the Vidal competition. His "Arrowplane" was the first to meet their rigid specifications. The next step was the formation of the Waterman Arroplane Corp. to produce the "Arrowbile" or flying auto. Five of these planes were built and three of them flown to the National Air Races at Cleveland in 1937. Finances of the corporation came to a grinding halt, however when the promoter thereof, Harris M. Hanshue, died unexpectedly. Both the "Whatsit" and one of the "Arrowbiles" are at the Smithsonian Institution for exhibit when the new Aeronautics building is completed. After recovering from a year's serious illness, Waldo took on a job at Pasadena College as Co-ordinator of Civilian Training under that C. A. A. program which was then just starting. He stayed with this work for three years and developed one of the largest of these programs in the country. He then resigned to accept the position of Chief Engineer of Convair's Research Division at Dearborn, Mich., where he was associated with his old time friend, William B. (Bill) Stout, who was Director of Research, returning to the West Coast at the end of W. W. II. As a hobby, Waldo has done a great amount of yachting and in recent years of retirement has concentrated his activities on sail boat racing with his fory-one foot fiber glass hull sloop "Lady Godiva," which is well known in So. Calif. yacht racing circles. Waldo still flies, and still holds an active Commercial Pilots license, and at this writing made his last solo on July 31st, 1962, over fifty-three years after his first solo. He has been an officer or director in many aeronautical organizations ranging from President of the old Professional Pilots Assn., to Mr. OX-5 of 1961-62. The one he is by far the most proud of is his current Presidency of the Early Birds. Shown at the Waterman dedication are (left to right) in front row: Otto W. Timm, Leslie Irwin, Tiny Broadwick, Hilder Smith, Edmund Bates, Ivan Wheaton, J. R. Hutchinson, Col. H. S. Martin, Maj. G. E. A. Hallett, Capt. George Gillespie, Filip Bjorklund, and Adolph Sutro. Waldo Waterman at the monument. John Gray and Harold Kantner were also present. L to R; John Nichols, Bill Diehl, Tex Marshall, Charles Meyers, Walter Bullock, Paul Garber, Harry Copland, Waldo Waterman, Walter Addems, Stanley Vaughn, Ivan Wheaton, Glenn Messer, George Page, Charles West, Forrest Wysong and David Young. 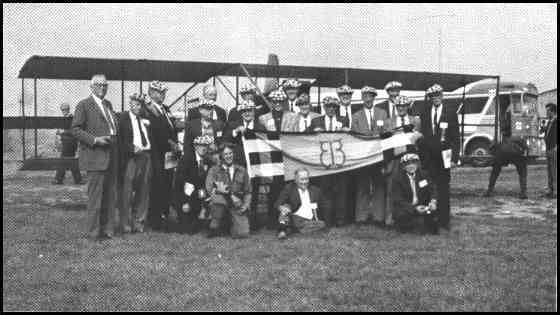 Front row: George Clark, Dale Crites (pilot of plane), Jean Roche and Melvin Hodgdon. ONLINE RESOURCES If you search for "Waldo Waterman", using the Google search engine, (10-1-04), you will find about 275 links! Among the most helpful are the following. "The unconventional design of the Whatsit tailless airplane was the first design of Waldo Waterman's quest for an airplane that would be as easy for the average man on the street to fly as it would be for him to drive his "Flivver" automobile." You can read the whole story of this unique design by clicking on the title above. The Flying Automobile I was alerted to this really remarkable resource by Al Weiss. It is especially devoted to the story of the Arrowbile, but includes much other relevant history including some information on and a photo of the "Whatsit." It is well illustrated with interesting photographs. You can access it by clicking on the title above. PERSONAL REMEMBRANCES You will find a delightful anecdote by Waldo on the AeroFiles website. It is one of a collection of remembrances which come from the July 1953 issue of the Aero Digest. You can read his story, and those of several other Early Birds by clicking on the title above. You may want to use the FIND function on Waldo to locate his place on the page.